First, what U.S. state does this delicious little bryozoan resemble? It’s so close I can even pick out Green Bay. 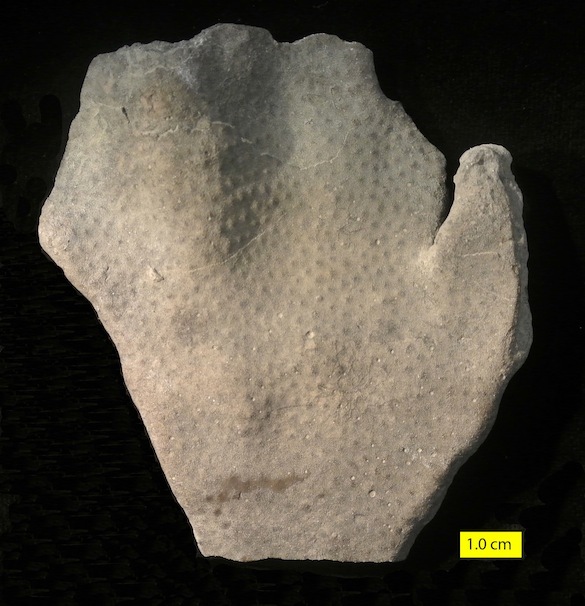 This is Heterotrypa frondosa (d’Orbigny, 1850), a trepostome bryozoan from the Corryville Formation (Upper Ordovician) in Covington, Kentucky. I collected it decades ago while exploring field trip sites for future classes. This zoarium (the name for a bryozoan colony’s skeleton) is flattened like a double-sided leaf, hence the specific name referring to a frond. In the view above you can see a series of evenly spaced bumps across the surface termed monticules. A closer view is below. 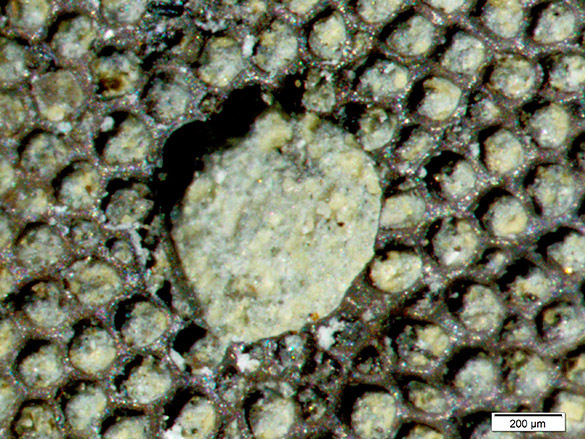 The monticules are composed of zooecia (the skeletal tubes for the individual bryozoan zooids) with slightly thickened walls standing up above the background of regular zooecia. The hypothesized function of these monticules was to make the filter-feeding of the colony more efficient by utilizing passive flow to produce currents and whisk away excurrents from the lophophores (feeding tentacles) like little chimneys. 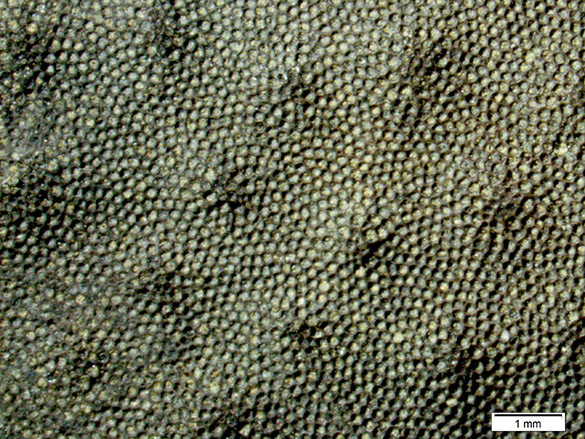 In 1850, Alcide Charles Victor Marie Dessalines d’Orbigny (French, of course) originally named this species Monticulipora frondosa because of the characteristic bumps. If you look closely at the zoarium you will see holes cut into it that are larger than the zooecia. A closer view of one is shown above. These are borings called Trypanites, which have appeared in this blog many times. They were cut by some worm-like organism, possibly a filter-feeding polychaete, that was taking advantage of the bryozoan skeleton to make its own home. It would have extended some sort of filtering apparatus outside of the hole and captured organic particles flowing by. It was a parasite in the sense that it is taking up real estate in the bryozoan skeleton that would have been occupied by feeding zooids. It may not have been feeding on the same organic material, though, as the bryozoan. It may have been consuming a larger size fraction than the bryozoan zooids could handle. d’Orbigny, A. D. 1850. Prodro/ne de Paleontologie stratigraphique universelle des animaux mollusques & rayonnes faisant suite au cours elementaire de Paleontologie et de Geologic stratigraphiques, vol. 2. 427 pp. Masson, Paris.